“I live in the CUF neighborhood of Fairview, with my wife, Deqah, our two cats, and six chickens. “Originally from Dayton, I’ve lived in Cincinnati since 2009. But I didn’t really call this place home until 2011, when I found our house and bought it for almost nothing as it was a condemned building on the city’s vacant building list. Like a lot of the vacant houses around here, it had been squatted by others for years; all the electric, plumbing, and anything of value had been taken out. “I work in construction so it was great getting to start with a shell and make the house exactly how we wanted. It took about six months to bring it back up to code and really make it our own. “One of the first things I noticed in the neighborhood and have wanted since the day we bought our house, was the lot next door. I originally tried to contact the owner, but had no success. I learned that even if the owner agreed to sell it to me, I would have had to pay the $30,000 demolition lien that had been placed on the property. At that point, I saw it as a lost cause. But we care a lot about our home and neighborhood, and began caring for the lot. In the summer of 2011, I planted three fruit trees at the top of the hill. I looked into other ways to get it over of the years and was even told by the city code enforcement people to stop caring for it because if it racks up long grass fines it might come to a tax auction faster. That didn’t work and just made my corner look bad. “And then last April, I learned it was going to be auctioned off, with the starting bid of 34k. I knew I couldn’t afford it. I crossed my fingers and fortunately for me, it didn’t sell. In June of last year, I started calling around city offices and was told that if I waited until June of 2018, it would go to auction again, with a starting bid of only $50! It was still a gamble, but was the best plan I had until someone mentioned the Redevelopment Authority and that there might be an easier path forward. 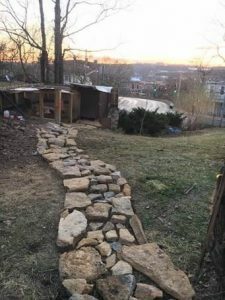 “I was excited to learn that the Redevelopment Authority had a lot to yard program, which helped homeowners like myself to purchase vacant lots that are adjacent to a homeowner’s property. I talked to Will Basil, who walked me through the process and I turned in my application that same day…and the rest is history. “As with most millennials, Deqah and I want to live near where we work. She works in OTR and I work in the West End. One of the tradeoffs in living close to downtown is typically a smaller yard size. But thanks to the Redevelopment Authority and the lot to yard program, I was able to double our yard side and follow my dream of urban farming. Most people who share this passion start with chickens. 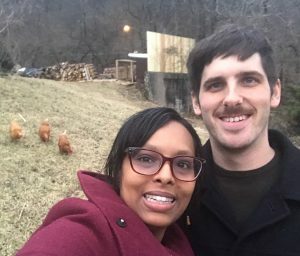 In the city of Cincinnati, you are allowed to have up to 10 chickens (no roosters), and your coop has to be 25 feet away from any structures. “Chickens are easy to care for and home grown eggs are the best you’ll ever eat. There is also a sustainable component in that the chickens eat any organic table scraps or spoiled vegetables. I like to let them free range in the yard whenever possible, so they can find their own bugs and help fertilize and aerate the yard. “The pen they were in before was much smaller as it had to be located in the back corner of our original lot (about 35 feet X 25 feet was the whole yard). If you have the space and time I’d encourage anyone to try. We love gardening as well but the backyard we have doesn’t get that much sun. In previous years we have rented a plot in the community garden that is next door. So this year will be our first attempt in our own yard. “The lot to yard program is an amazing idea. Megan Meyer and Anna Ausman guided me through the whole process and made it very easy; the hardest part was waiting. My one critique would be that I had no idea the program existed until I got lucky and talked to the right people. If there was some way to make a list of vacant lots adjacent to qualifying individuals and reach out to them, I feel like the program would be much more utilized. I’ve told everyone in my community group about it and only one person knew the lot to yard program existed. The Lot-to-Yard Program is for owner-occupants interested in acquiring residential vacant land adjacent to their home.